1 night at Radisson Airport or similar in Calgary. 2 nights at Caribou Lodge /Banff Voyager Inn / Holiday Inn or similar in Banff / Canmore. 1 night at Chateau Jasper / Lobstick Lodge or similar in Jasper. 1 night at Ramada Kamloops or similar in Kamloops. 1 night at Delta Whistler Village Suites / Aava or similar in Whistler. 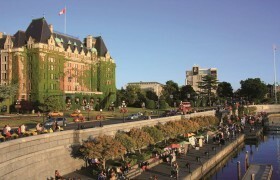 2 nights at Sheraton Vancouver Guildford Hotel / Four Points by Sheraton or similar in Vancouver. • Photostop at Lake Louise. • Ice - Explorer ride on the massive Athabasca Glacier in Columbia Icefields. • Enjoy Peak 2 Peak Gondola Ride. Single room supplement USD 810 per person. • Land Season surcharge will be applicable for Departure from 25th May to 30th Sep 2019. Twin/Triple USD 150 , Single USD 215 & Child USD 30. Visa Requirements: You must be in possession of a Multiple Entry Visa for Canada. The cost of this visa is not included in your package tour price. It would be best to check with your travel agent and the consulates nearest to you for advice and information. Please ensure that your travel documents are ready in time for departure.